President assents into law Fisheries Management and Development Bill – Kenyatta University TV (KUTV). All Rights Reserved. 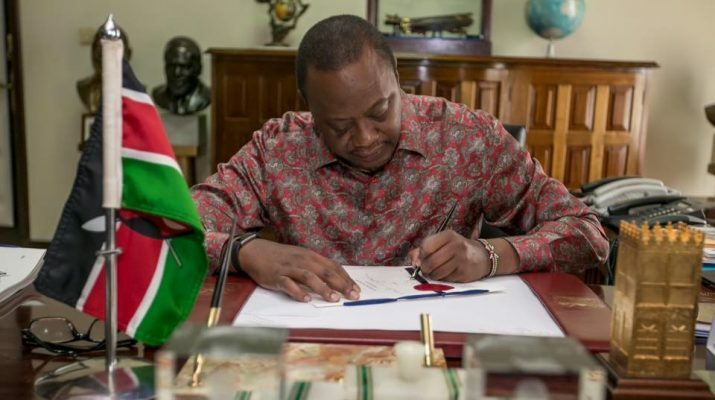 President Uhuru Kenyatta has signed into law the Fisheries Management and Development Bill. The new law also gives guidance on the import and export trade of fish and fish products, fish quality and safety among other provisions. It also establishes the Kenya Fisheries Services and the Kenya Fisheries Advisory Council. Speaking when he signed the Bill before commissioning the Ksh30 billion first phase of the second container terminal at Mombasa Port, President Kenyatta said the new law will ensure that the country’s marine resources are used for the benefit of Kenyans – especially Coast residents. “With this law in place, we are able to protect our marine resources from exploitation by other nationals at the expense of our people,” President Kenyatta said. He said the new law will also help the country to utilise the blue economy to create jobs for Kenyan youth. President Kenyatta also announced the formation of a committee that will be headed by Chief of Defence Forces, Gen. Samson Mwathethe, to fine tune ways that will guard marine resources against external exploitation. The committee, which has been given one month to present its report, will also look into ways of building fishing vessels and industries that will create jobs. On regional integration, President Kenyatta affirmed that the East African member states are working in harmony to promote the welfare of the citizens of the region. He said there is no bad blood between Kenya and Tanzania, saying the two neighbours have always enjoyed warm relations. “East Africa is not in competition with itself but with the rest of the world,” President Kenyatta said. Deputy President William Ruto underscored the need for Mombasa County government to work with the national Government that has initiated several projects, including the allocation of Ksh750 million for specialised medical equipment for Coast General Hospital and Ksh400 million for Likoni hospital,that will improve the lives of residents. He told Governor Hassan Joho to be honest, put aside partisan politics and work together with the national Government for the benefit of the people.